A year after the end of a major war between the human realm of Septpia and the four realms that are homes to beings called Foreigners, Liones Yelistratova, the princess of the small nation of Liones, travels to Pirari Academy in Hokkaido with the intent of becoming a Logicalist, an individual who can “trance” with a Foreigner (most commonly a goddess) to empower herself. Liones is a special case in that she actually made a covenant with a Foreigner as a young child and has a Foreigner as a pet, so she is put into Class S, composed entirely of Logicalist girls who have already made covenants. Among them is Nina, a girl who formerly worked for the Logicalist organization ALCA during the war and is now at a loss over why her chief insisted on her coming to this academy. In Liones and the other girls, she may find what she is looking for. This 2017 series is a spin-off of the 2016 anime, Luck & Logic . However, no familiarity with its predecessor is necessary to understand this one, as it does a good enough job of explaining the underlying mechanics, and crossover characters are limited to a trio of guest appearances and cameos. Frankly, viewers are probably better off not having seen the original, as despite sharing a world and power structure, this is an utterly different kind of show. For those who have seen the first series, the differences between these two series are stark and immediate. Whereas the first series focused primarily on a male character and had a few other recurring male characters, the only named guy who appears at all in Hina Logic is the father of the lead protagonist. 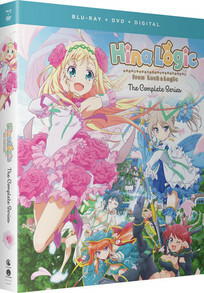 Whereas the events in the original focused on an ALCA branch office, Hina Logic mostly takes place within a Logicalist training school. Most importantly, the darker tone and more action-heavy approach is completely discarded for a standard slice-of-life school romp with the Logicalist element thrown in on top. The action hasn't entirely gone from the premise, but it's less frequent and the stakes are never all that high. There's a lot more comedy, too. Granted, this series is taking place in a time of peace following the events of the original, but the extreme stylistic transition can still be jarring. Another key difference is that the Covenanters in this series don't live side-by-side with the Logicalists; in fact, they don't manifest separately in Septpia at all. They just integrate with their hosts when called upon. For the most part, Hina Logic is a magical girl-flavored version of a standard magic high school anime that focuses on cute girls doing cute things. The activities that the girls engage in can be mundane to the point of inanity, with most content being episodic. Most prominent among the few ongoing story threads is convincing Nina that the school really is the best place for her, and this thread is the most fully-realized by the end of the series. Another is helping Liones adjust to a dangerous degree of Trancing affinity, though that's not handled as diligently. These story threads compose the bulk of what little the series has in terms of crises. With not much in the way of plot, Hina Logic relies heavily on character interactions to entertain. The result is a decent but unspectacular effort. Tomboyish Liones is pretty much the standard genki girl, while Nina is her tailor-made foil as the more serious student. Most other characters also fall into standard roles for lighthearted school anime, including the tech whiz who's always blowing things up, a maternal upperclassman, a couple of drunkard teachers who lament that they can't find good men, and a rich girl and her loyal servants. The one mark in the series' favor is that these characters don't always rigidly conform to their archetypes; the rich girl is remarkably reasonable and friendly for a character of her type, while the Student Council President is also the resident pervert. The interactions between characters can be entertaining, but they don't offer much that can't be found in any other school-based show. The structure of the series doesn't offer much extra support. The reason that the principal can seemingly appear to be two different ages is never explained, though an early joke about her playing the harp is pretty funny. About two-thirds of the way through the series, the concept of a Logicalist trancing with two different Covenanters – and even being able to switch freely between the two once she reaches a certain level – is casually introduced as if it's always been common knowledge, though it has never come up in the franchise before. Also never explained is why all of the Logicalists are female when the first series made it clear that male Logicalists also exist. At least the series does reaffirm that Logicalists are teenagers because their abilities develop with puberty and fade as they become adults. It is a lazy way to justify the age of the cast, but it's also fairly common in fantasy fiction. The technical merits by Doga Kobo are a small improvement over Luck & Logic , but that isn't saying much. The highlights are the elaborate background designs for Pirari Academy, especially the ridiculously spacious classroom for Class 1-S, though character animation is overall a significant upgrade as well. Regular character designs are run-of-the-mill for anime, while tranced Logicalists vary between classic ultra-cutesy magical girl style (for younger-looking girls) and more risque outfits (for the older girls). The general color scheme is also distinctly brighter and far less prone to pastels than its predecessor. The musical score is provided by a new music director, which may be part of the reason why the sound of this series is its biggest step away from its predecessor. With little major drama happening in the series, the soundtrack instead relies on a core of pleasant ditties to suit the fluffier tone of the series well. Even on the rare occasions that things do get serious, the music remains understated. Opener “Butterfly Effector” is more noteworthy for the visual gimmick of “animating” its characters as cardboard cutouts, while the peppy closer “Baby Bird ~Gakuen Logic,” sung by the three lead seiyuu , doesn't really stand out. Extras are limited to a clean opener and closer and some trailers. It does at least include the standard Blu-Ray/DVD packaging and an English dub , which was originally simuldubbed. Casting choices are generally fine, and there are no major quibbles to be had about performance quality. The most distinctive effort is probably Mikaela Krantz 's rendition of Yayoi, where she mostly succeeds at finding a delicate balance between making her character friendly and haughty. Overall, Hina Logic does not shine in any specific regard and has some significant flaws, but it can still be mildly entertaining. It could serve well enough as a light diversion for those interested in the genre, but isn't really memorable enough to recommend on its own.